A federal grant is paying for a local conservation group to dot the eastern Connecticut landscape with 100 rain gardens designed to absorb pollutants in water runoff from parking lots, roofs and lawns. 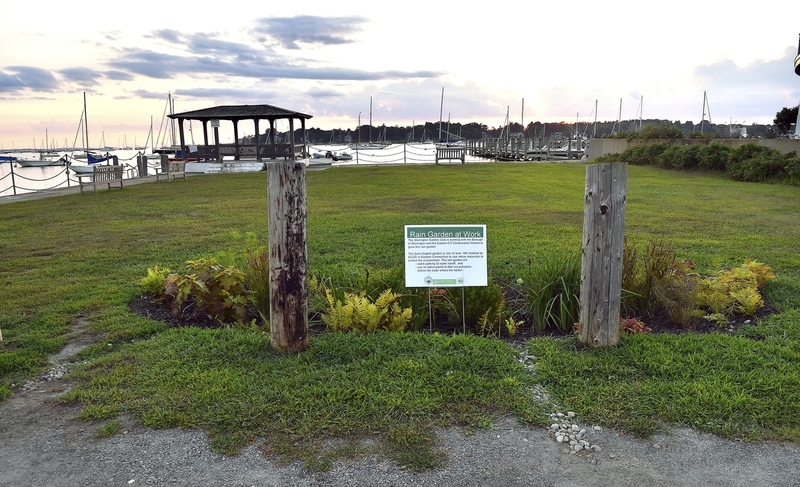 Staff at the Eastern Connecticut Conservation District are partnering with gardening clubs, Boy Scout troops, businesses and town officials to use a nearly $85,000 grant from the Long Island Sound Futures Fund and the federal Environmental Protection Agency for the rain gardens. Rain gardens, usually built in 6-inch depressions with hardy, native plants where water runs off nearby impervious surfaces, such as driveways, have become a common tool in the fight against waterway pollution because they can absorb runoff before it flows into bodies of water. "Most stormwater ... drains directly off of impervious surfaces, and it's very contaminated," Eastern Connecticut Conservation District Executive Director Dan Mullins said. "It could be bacteria, nutrients from fertilizer, it could be gas and oil and other fuels from cars." Since May, when the grant was distributed, the groups have installed about half of the 100 planned gardens, and Mullins said his staff is trying to get the rest installed in the 36 towns the district serves by the end of January, when the grant expires. Working with volunteer groups, the conservation district staff have installed rain gardens at the United Congregational Church in Pawcatuck, the Lebanon Historical Society Museum, the Mystic Museum of Art, Gardner Lake in Salem, the Oswegatchie Hills Nature Preserve in East Lyme, and others. "We try to get some assistance from town, or whoever's interested, in trying to find a suitable location," Mullins said. Members of the Stonington Garden Club helped design and install a small garden at the base of a parking lot near Wayland's Wharf in Stonington Borough. Based on the recommendations of University of Connecticut plant experts and with permission from town commissions, the club planted coral bells, switch grass and several different types of ferns, among other species, in a small indent filled in with top soil and small rocks that will catch and absorb water that flows off the parking lot during storms. "They act as nature's water filters," said Kilby Williams, the club's conservation chair. "They're filtering all the toxins before they get into the harbor." As part of the same project, the conservation district is hosting educational workshops and has distributed 60 rain barrels, which collect rainwater runoff from roofs to be used for watering gardens and yards. District staff are planning two more workshops, where then will distribute 30 more rain barrels. Mullins said the district is planning to help install gardens at the Eugene O'Neill Theater Center, the Pine Grove Neighborhood in Niantic, the Martin Senior Center in New London, and others.